The Vera Fund – Fundraising for the overhaul of WD 3672 "Dame Vera Lynn"
The locomotive at the centre of this appeal is No 3672 “Dame Vera Lynn”, Built in 1944 by the North British Locomotive Works in Glasgow, there were 150 of these extremely powerful freight locomotives ordered for the war effort. Once completed “Dame Vera Lynn” was shipped to Egypt and worked there following D-Day. This Austerity class of locomotive were not built to last more than a few years in traffic, they were of a cheap and simple design due to material shortages during the war. We count ourselves lucky to still have her with us today, so we can tell her story to future generations. “Dame Vera Lynn” entered traffic on the railway in 1989 and over the next 10 years worked very hard. Aside from the exceptional feat of accumulating in excess of 100,000 miles during her ten years in traffic, she also delighted the staff and tens of thousands of passengers along the way. “Dame Vera Lynn” proved on countless occasions, what a strong, reliable and popular performer she was, a real stalwart of the 1990s. 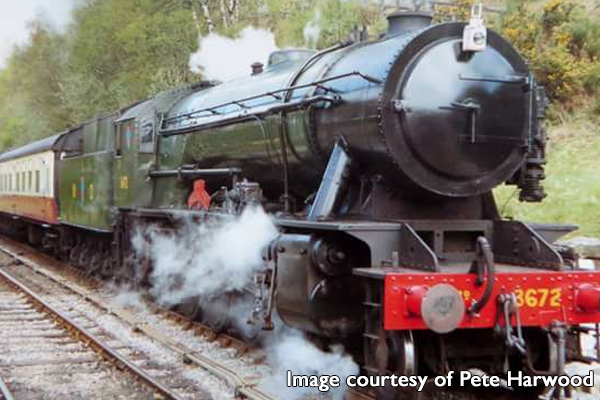 The Vera Fund is an appeal with the aim of getting the railways very own Wartime steam locomotive back in traffic, so the railway and its passengers can enjoy the sight and sound of a genuine wartime locomotive hard at work again. The appeal needs to raise approximately £450,000 in order for Vera to have her well-deserved overhaul, to date we have raised £150,000 and still going! The boiler engineers are due to visit us around April/May time to get things started with the boiler. We are now at £150,000 of funds raised, we can’t thank you all enough! All donations, no matter what amount, are greatly appreciated! Your donations will help us raise the funds needed to support the overhaul. The more we raise, the closer we can get to having “Our Vera” back on the rails working trains once again! Click here to Donate Now through the website.